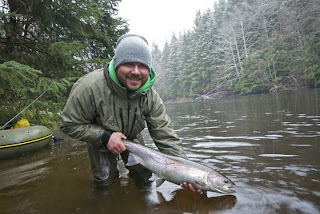 The Kanektok river is a special place that you should fish, especially if you want to catch monster King Salmon on swung flies and gagger Rainbows on mouse patterns in the same day. 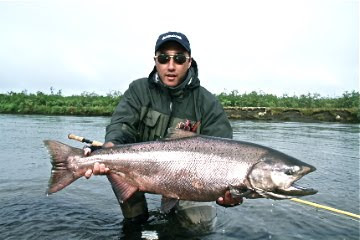 Malcolm Wood joined us for week #5 last year at Alaska West and on the last day of his trip caught the King and Rainbow pictured here. The King required a short boat chase to land and was caught in the morning. In the afternoon Malc went Rainbow fishing and coaxed up this beauty on one of guide Kevin Price’s signature mouse patterns. 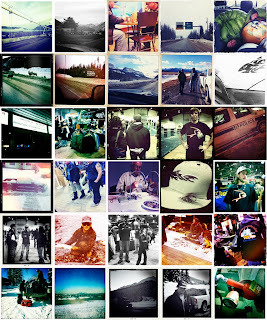 We still have some last minute space for week #5 at Alaska West, July 8th-15th 2011. Give us a call if this inspires you to join us on the Kanektok for this fun week. Just a couple of shots at a birthday fish for our good friend Yos Gladstone a few weeks back. We had some real fun fishing for winter chrome. Putting an arc on the Metal detector and no, its not snagged..
A shot of all the boys, look forward to it again next year! When you fish salmon bearing streams at this time of year, you will notice the amount of salmon fry present on shorelines and back eddies. Nothing quite satisfies hungry trout and Steelhead like a protein packed salmon fry, so much that most fish won’t even look at anything else. This fry pattern utilizes Ostrich for the back and Diamond braid for the body with stick on eyes, simple ingredients that make it quick and easy to tie. The epoxy coating insures durability, weight and gives the fly a brilliant sheen, adding an extra touch of realism. Start off with an appropriate hook for the size of the fry you will imitate. This is a size 4 straight eye 1750 Daiichi. Whatever works for you, though try to avoid down turn eyes. Using White or Grey thread, wrap a strip on lead along the bottom of the shank. Tie in the diamond braid out the back of the hook and some Olive Ostrich herl out the front. Wrap the braid forward, overlapping just a little bit and tie off close to the eye of the hook. Tie in some red “string”, here I used larva lace, but red wire, yard or thread will work. Wrap a few times for the gill and tie off. Whip finish. Tie in at the tail of the fly, pull the Ostrich back and tie town. Whip finish. 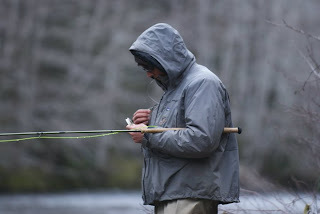 Take a lighter and burn off all the long fibers from the back of the fly (not the tail). Any longer fibers will make the epoxy stick out and look pretty bad. Pinch the tail about .5″ back and rip off the excess Ostrich dangling from the back of the pattern. Ripping rather then cutting gives it a more natural appearance. Add stick on eyes and your pretty much done the fly. Add your epoxy, it is good to epoxy a bunch at a time rather then just 1 or 2. 5-10 minute epoxy works, though it tends to shatter a little easier then 24hr cure epoxy. A rotating dryer is a great tool for the longer cure stuff. Add the epoxy evenly and don’t add more then you need. 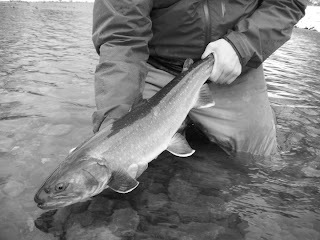 If you can, try to keep more on the belly of the fly to insure it rides right side up in the water. Done! Here is a simple method of making quality prawn/shrimp/bug eyes with a few basic materials. They look just as good as pre-made eyes but much cheaper and customizable. You will need: 40lb mono or 50lb Slickshooter, a lighter, Black permanent marker and Krazy glue. First, light that sucker up. Keep too much heat from the ball of molten mono and work it until it is a desired size. It shrinks when it cool as well, so make it a tad bigger then you want it to look. Make sure not to get any liquid mono on your hands, it really hurts! It should look like this when its done and cooled off. Don’t heat it too much afterworks or it will burn and become brittle. Stick it in some cold water to cool it right away. Color it up with some permanent marker. Black works the best. Now Krazy glue or Zap-a-gap and your done! its easy to make a few dozen eyes like this at once so you have a decent supply. They look sharp, last a long time and can be made using a variety of materials. Next step, I’ll actually find a use for them, time to make some Prawn flies! 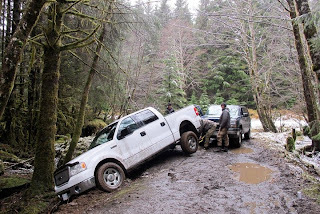 A well made video of the life of a real Steelhead family, the Clays. Check it out if you haven’t already! Starting off with backing, there are a few knots you can use to tie it off. I use 2, the first being the end loop knot which is strong and easy to tie but a bit Bulky. The second is the Bimini twist which takes a bit of practice but is the strongest of the bunch. Make sure that the loop of backing is big enough to go around the reel or spool of running line. Then I take my Slickshooter and tie in a perfection loop. IMPORTANT! when you tie your loop, make sure that the Slickshooter is lined up flat and there are no twists, otherwise when you tighten the knot the sharp side of the line will cut through itself. You will know very quickly if you did it wrong when you test the strength of the knot. If done right, you should have a perfect loop that shouldn’t break for any good reason. Loop the Backing on the running line and reel the rest on. Tie a perfection loop on the other side of the Slickshooter and attach the Line. Easy! Spring is when many Salmon fry start emerging from the gravel spawning beds they were born in. Warmer water temperatures generally start this “hatch” and it runs until summer runoff. When alevin start emerging from the gravel, the trout, Char and even Steelies really don’t have a better source of food then a feeble swimming protein pack such as these young Salmon. 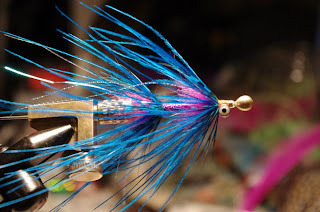 Here is a pattern I came up with that with a little practice takes a couple minutes to tie. You will need: #10 or 8 egg hook, white thread, micro pearl Mylar tubing, orange yarn, Stick on eyes and Epoxy/Aquaseal = Krazy glue. The best way to fish it is like a Nymph or single egg. Floating line with some twist-ons and dead drifted with the occasional twich… be prepared to slay em! Remove the yarn from inside the Mylar tube, it makes it to thick. The hardest part of this pattern. Pinch the tubing and wrap a bit of thread close to the end of the tail and right up against your thumb were it is ridged. A few loose wraps followed by a couple tight ones and then hitch/ Whip finish and Krazy glue on the thread. Put some thread on the hook, you don’t need to work it any further down then the top 1/3rd of the hook. Attach the other end of the tubing on the hook, try to keep it as thin and compact as you can. The body should be around 1.5x the hook length at max. Fold a very thin strip of yarn in half and tie in under the head of the fly. Trim the excess. Whip finish and throw some small stick on eyes on that sucker. Add epoxy or Aqua seal on the head of the fly and let er dry. Looks killer in the water and the fish don’t stand a chance! 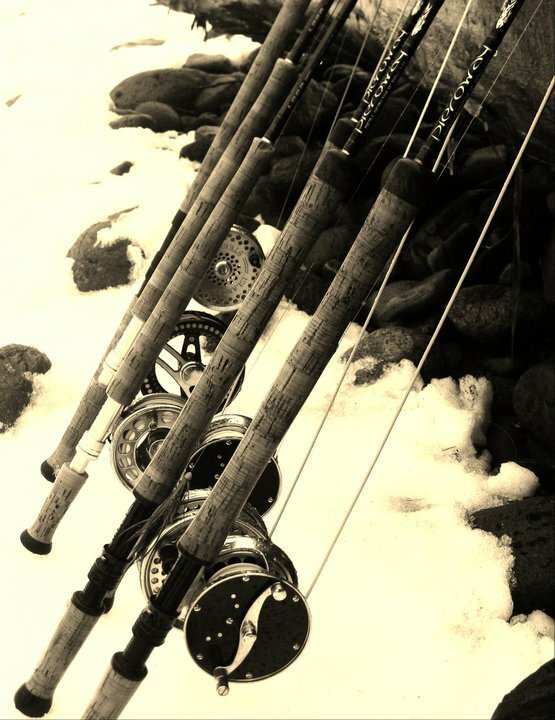 Skiing and Steelhead all in the same day, can it get any better? 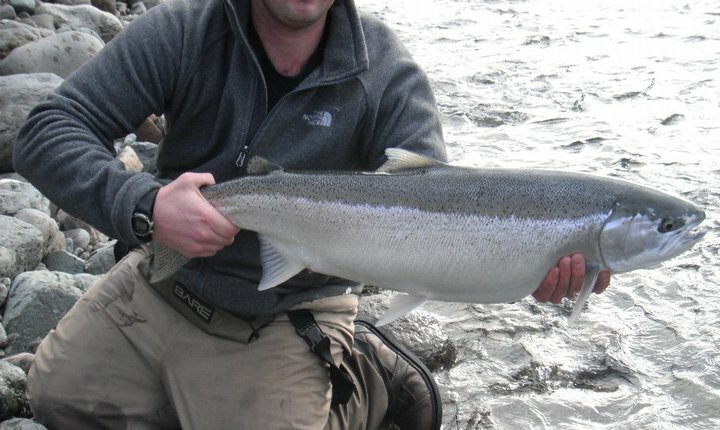 So thats how Steelhead look eh? 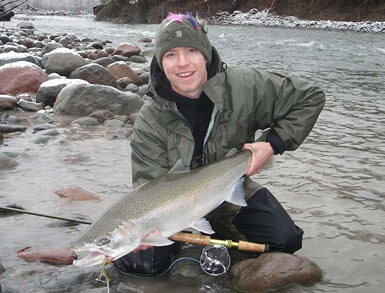 Everyone knows Winter Steelhead love bubblegum pink, egg sucking leeches and lots of other colorful flies. What most people don’t seem to realize is that Steelhead love the Sculpins. 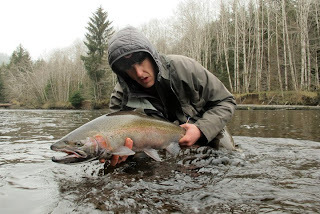 Pressured Steelhead or Steelhead holding in low clear and/or cold water are sometimes hard to get on generic colorful flies in many cases, however for some reason they don’t seem to be able to resist a swung olive rabbit fly resembling a Sculpin or Lamprey. 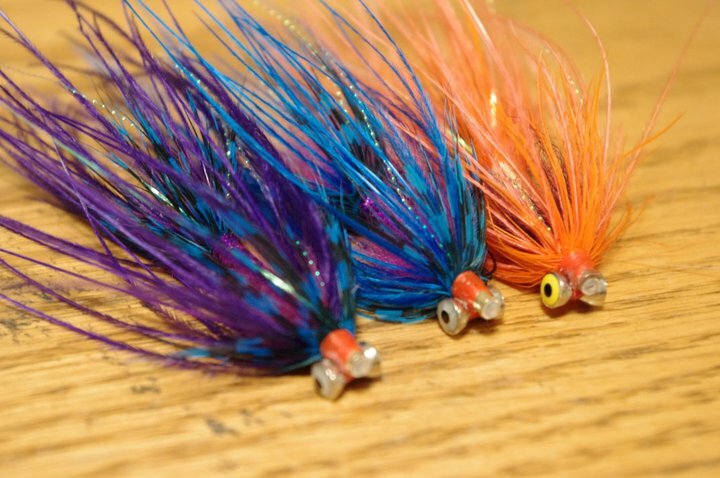 Steelhead absolutely crush Sculpins and I know many fishermen (my self included) that use them specifically for Steelhead. Using a natural presentation ensures most trout and char in the area are willing to bite your fly as well which makes for a slightly fishier day. Flies like Silveys Sculpin, the egg Stealing Sculpin or Idlys Blossem are great Sculpin patterns that work for both Trout and Steel. Even the good old Muddler Minnow is a killer for low water fish. 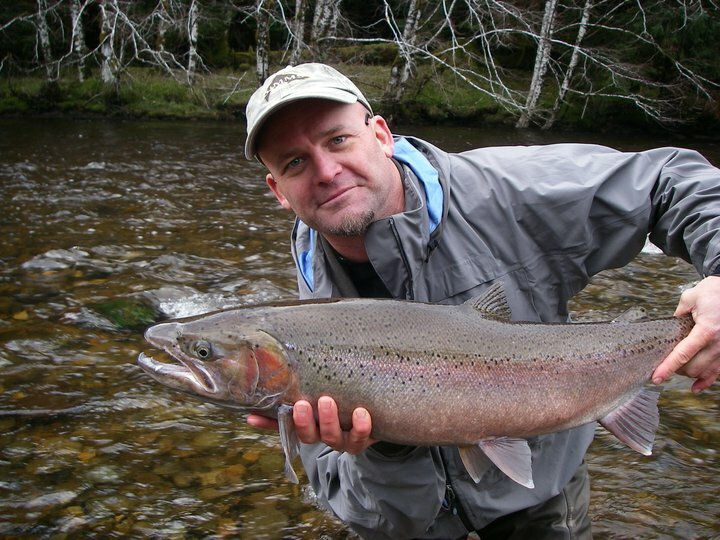 Next time you’re out swinging for steelhead, try the olive in your fly box, you might be surprised by the results. Frank with a Tank taken on an Olive Sculpin Imitation, just look in its mouth! The Rhea Tube fly has an entire flybox of its own in my collection. Intruder like in style, I tied this fly with with versatility and durability in mind. In blacks, blues, purples, oranges and pinks It’s an awesome winter Steelhead fly. The tube is weighted as are the eyes so its very heavy, though a plastic tube would work fine to lighten it up as well. The under body is spun seal fur, though any stiffer synthetic dubbing will do. Wrap some rhea in front and finish off with a guinea fowl feather. After wrapping tinsel or guidebrod wrap for the body, repeat the steps for the front portion of the fly and add flash and eyes. Viola! done, it looks great in the water and takes minimal amount of time to make. Use a octopus style hook on a loop of mono when you rig it up. If you use crazy glue, the fly should last until you catch a tree with it. I will add step by step pictures when I have the opportunity. Depth charges to say the least! 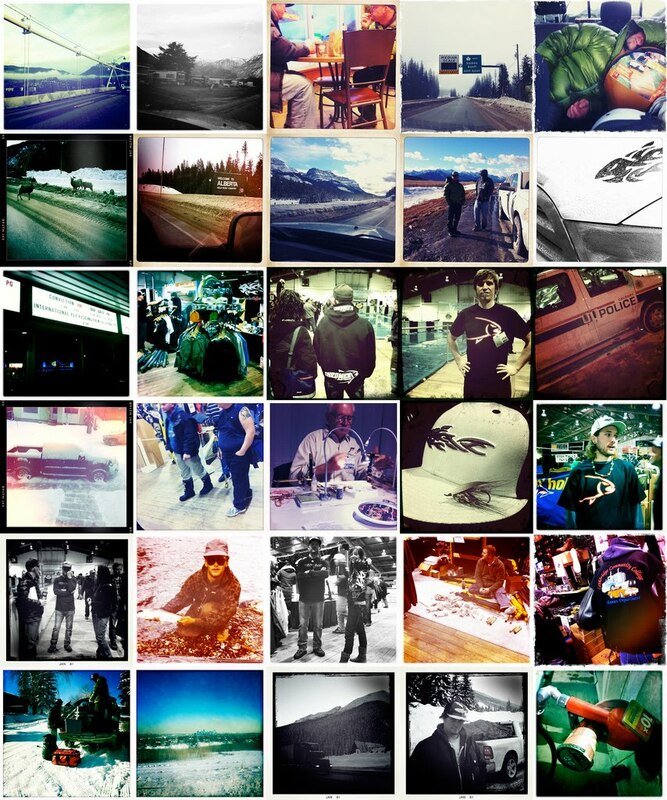 Talented and always classy Yos Gladstone took some quality photos of the trip to the Calgary fly expo this winter. Check em out! Just got a shipment of new Whistler Fly Fishing logo shirts in. Check em out at the shop or give us a call for details. In our costal river systems, large presentations work great as most bigger river fish feast on the smaller fish and lamprey. Big flies are fun to fish, evoking an aggressive response in Char, trout and Steelhead/Salmon. The Sting leech is an easy to tie fly with a nice sillouette in the water. The rabbit looks realistic in the current and a trailer hook has good hookups. You can tie them in virtually any color, from pink to olive or whatever. You will need: Black Rabbit, black 3/0 thread, 30lb braided or backing line, Purple Schlappen, cone head of preferred color ( Orange or Chartreuse look good) and a Size 4 or 2 octopus with a large cheap upturned eye hook to cut. First slide the cone on the hook you will cut, make sure the eye of the hook has enough room to double the braid or Dacron through. Guide the Backing through the cone, through the eye, and then back all the way through again under the fly and tie down. Wrap on some lead, tie down and Krazy glue. Tie in a section of rabbit a little bit longer then the trailer hook. Wrap the other end of the strip forwards with minimal overlap, when you hit the cone, wrap once extra and start tie off with the thread. Cut the excess off an push the extra wrap you made under the cone while twisting it a bit tighter. Tie down the rabbit some more and add some flash. Wrap the feather forward and tie off at the end. Trip the stem and whip finish. Put the trailer hook in the vice. Tie on a base of thread, then take the sting length of rabbit and tie in. Pull back the furs in order to tie directly on the leather strip. Cut off the bigger hook and file down the edges so the backing doesn’t get cut. Krazy glue all thread you see. The Skagit Minnow is a simple, easy to tie and highly effective pattern for winter Steelhead all over BC. Not only does it require few materials, but it is easy to cast and because of the trailer hook, lots of movement and good hookups are the norm. I make these in a veriaty of colors and sizes but the same basic steps are used in all of these flies. You will need: Size 1 or 2 Octopus style Trailer hook, 30lb Dacron backing, Saddle hackle, 2 different Marabou colors, Chenille, Dumbbell eyes, Schlappen feathers, Krysal flash and a cheap hook to cut, or a 20mm Waddington Shank. Colors are up to you, I used florescent Orange Saddles, fire Orange and Pink Marabou, Pink Schlappen and Pink Chenille. Start off with the Octopus Trailer, tie in 2 inward facing saddle hackles as the tail, kind of like a Deceiver fly. Cut the tip off the Marabou feather, tie in and wrap forward until the eye of the fly. Add a few strands of Krystal flash and whip finish. Fold the 30lb Deacron in half and thread it through the eye of the hook like a loop-to-loop connection. Make sure the 2 ends come of of the front of the eye. Feed the Dacron through the eye of the other hook/shank and tie down on both top and bottom. Make sure the backing is tied in straight so the hook rides right side up and doesn’t twist. Make a ball of Chenille, tie off and add another Marabou feather of the same color. Tie it in against the Chenille ball and wrap forward. Keep adding feathers until you are half way down the shank. Add the 2nd Marabou color and some more Krystal flash. Wrap in a couple of Pink Schlappen feathers. Tie a set of eyes on the bottom of the shank. Whip finish and glue. Krazy glue and Zap-A-Gap are what I use, keeps the fly together even after a few fish and rocks have ripped it up a bit. Piece of cake to tie, try it in olive or black for Bulltrout, Browns or whatever eats baitfish. A great fly for BC waters and an awesome fly for the Squamish river. 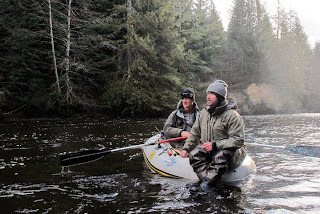 This winter has been a particularly good one for Rainbow Trout and Bulltrout, check out some of our recent pictures from guided trips on the Squamish and Cheakamus rivers. 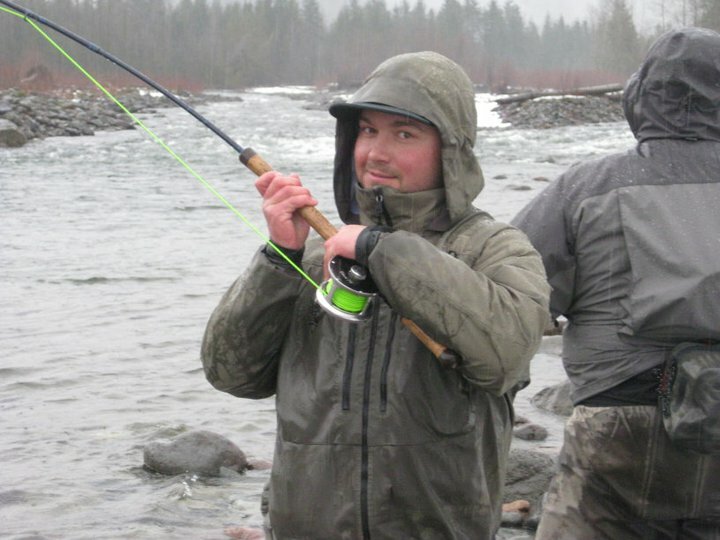 As with years previous, Whistler fly fishing will have a booth at the Calgary Fly show from January 28-30th. Our booth will be stuffed with our popular Whistler Flyfishing logowear and sweet deals on fly gear, along with Metal detector rods and clothing among other things. 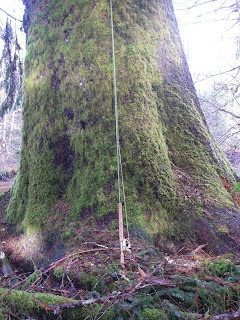 Our western Fly expo booth will have tying demonstrations done by local guide and Loop prostaff, Maxwell Robinson. 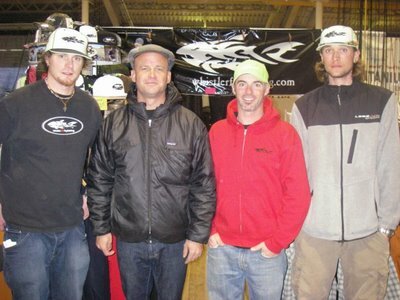 Fishing encyclopedia Scott Baker and Haida Gwaii big deal Yos Gladstone will be hanging around the booth offering advice, instruction and security services. 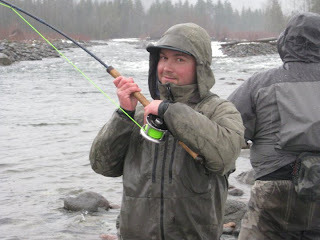 Of course Brian Niska will be there too, showing off some casting techniques, advice and instruction. If you are in the area, check us out!